For those of you who live in the most parts of the United States, the burrito is a fast food fact of life. Southern California in particular has its Mexican drive-through joints where the burrito is king. You can order a burrito stuffed with everything from carnitas to lobster; some burritos are advertised as being "as big as your head". Most are the equivalent of an entire meal, frequently eaten from your hands, dripping in the dubious safety and comfort of your car as you whiz along a freeway. One burrito that originated in San Francisco's Mission District comes stuffed with all the usual items (a meat, rice, beans, guacamole) and adds french fries, fresh from the deep fat! Here in Mexico, the burrito is a little more elusive. Not a native of the central or southern part of Mexico, it's been imported from the northern regions of Mexico to fill a niche in some local menus. Burritos (as food) are a relatively recent invention. The flour tortilla roll-ups are filled with meat, rice, frijoles refritos (refried beans), guacamole, and chile. 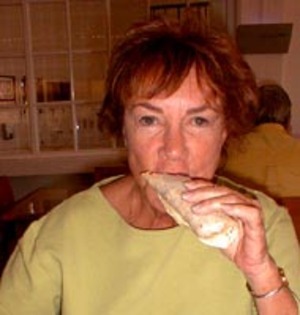 In his book Chicano Folklore, Rafael Castro says that the burrito (the food) probably originated in Northern Mexico and was not known in other regions of Mexico. It may possibly have originated in the American Southwest—Chicanos in Texas have been making them since the 1920's. The origin and first use of the word burrito for a special type of taco is muddy, however. One story has it that the 'new' flour tortilla and bean tacos were better suited than the crisper, more fragile corn tortilla to withstand travel in the saddle bags of the vaqueros (cowboys). 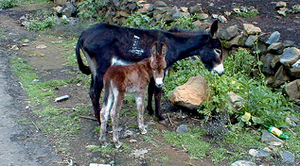 Castro says they came to be called burritos because young donkeys were often the "sidekick" of the vaquero's horse. Another story says that "burrito" comes from small children asking for a treat while their mother was making tortillas. She would form the masa (dough) into a small tortilla, heat it on a comal, smear it with beans, roll it up, and send each child away with one, satisfying them until it was time to eat. Another tale thinks the term came from a 1940's restaurant in Ciudad Juárez (just across the Mexican border from El Paso, Texas) called Los Burritos that sold these new flour tortilla creations. Yet another theory says that the word burrito originated among migrant workers in California's Imperial Valley. The fields were often too far from the lodgings provided for the workers for them to return home for lunch, so their rice and beans were cooked up in the morning, portions were wrapped in a large flour tortilla to carry them out to the fields. Thus the tortilla more specifically was the "little burro" used to carry the lunch, but the term burrito was understood to mean the whole package. 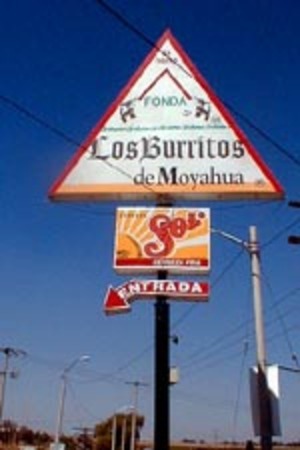 Out in the wilds of the state of Zacatecas, there is a little town called Moyahua (moy-AH-wah), where the burrito has reigned supreme since 1976, when the restaurant Fonda Los Burritos Moyahua opened. Now world-renowned, the restaurant opened its branch on the Chapala-Guadalajara highway (about half way between Chapala and the Guadalajara airport) in 1989. For 15 years Los Burritos has served burritos to hungry truckers, to bus loads of travelers, to ravenous families, to workers taking a break—to anyone who turns in off the highway, 24 hours a day, 7 days a week, 365 days a year. On Sunday afternoons the line of folks waiting to be fed often stretches down the entry stairs and all the way out to the parking lot. My friend Susan and I drove the 40 minutes from Guadalajara to Los Burritos for lunch last February. The restaurant is essentially a cafeteria; we each grabbed a tray and started down the line. The choices were plentiful: the menu includes chiles rellenos, chicken, and a few other standard dishes as well as the famous burritos, which is what we were craving. Every burrito is made in the same way: a freshly made flour tortilla about eight inches in diameter is smeared with a spoonful of frijoles refritos and filled with a good amount of your choice of eight to ten different guisados (stews). The day we were there, the guisados included cochinita pibil (pork cooked Yucatan style), tinga poblana (Puebla-style stew), carne de res a la mexicana (Mexican style beef, with tomatoes, onions, and chile), chicharrones con salsa verde (crispy fried pigskins with spicy green sauce), carne deshebrada (shredded beef cooked with tomatoes and spices), elote con rajas de chile (corn with green chile strips), and others, including my personal favorite, chilorio (cooked and shredded pork and diced potatoes, seasoned with chile and a variety of spices). In addition to the burritos, you'll be tempted by chunks of cheese (queso fresco or panela) to add to your plate and desserts such as arroz con leche (Mexican rice pudding), flan (Mexican caramel custard) ,and jericailla (plain Mexican custard). Grab a soft drink or a beer, pay at the end of the cafeteria line, and head for a table. Place an order for quesadillas (and do order at least one; they're the best I've eaten in Mexico) and you'll be given a number to place on your tray; after you're seated a waitress will bring the quesadillas to you at your table. Expect to pay very little for your meal. Susan and I ordered two chilorio burritos, one burrito of cochinita pibil, two quesadillas, a chile relleno, two chunks of queso fresco, and two soft drinks. The total bill for the two of us was under 80 pesos (Less than $8 USD). La Fonda Los Burritos has three large dining rooms, two huge indoor rooms and another outdoors under a roof for shade. You'll find wonderful fresh salsas and pickled chiles jalapeños available on a table in each dining room. In addition, there are posters in hand-lettered Spanish hanging from the ceilings of all three areas. The posters are changed from time to time; when Susan and I were there, love poems by the romantic Spaniard, poet Gustavo Adolfo Becquer (1836-1870), were hung in honor of February, the month of love. La Fonda Los Burritos de Moyahua is located on the west side of the Chapala-Guadalajara highway just past the exit for La Barca (as you're driving north), almost directly opposite Motel Eddie's. Wrap the tortillas in foil and warm in a 250 degree oven. Fry the bacon and remove from the skillet when crispy. Drain on absorbent paper and crumble. Add the onion to the skillet and sauté until softened. Stir in the potatoes and sprinkle with cumin, salt, and pepper to taste. Fry until the potatoes are well-browned; you may need to scrape the bottom of the skillet with a spatula so that the potatoes don't stick. Lower the heat and stir in the eggs and green chiles. Scramble with a fork until the eggs are completely set but still moist. Remove the skillet from the heat and stir in the cheese and the crumbled bacon. Spoon 1/4 of the mixture across the middle of each warmed tortilla; be sure to leave room to fold the tortilla. Sprinkle on some diced avocado. Fold two sides of the tortilla over the filling, slightly overlapping. Fold up the bottom to cover more of the filling and roll into a cylinder. we enjoy stopping to grab burritos on our way to visit my dad's hometown - Juchipila. It's always a treat to grab a burrito en Moyahua. Delicioso!